Work is starting on a £7.5m, 80 bed new Travelodge hotel at Monks Cross which is set to complete in November this year. Max Reeves, development director at Helmsley Group, comments: “This positive investment from a major hotel brand is another strong endorsement for the city of York”. 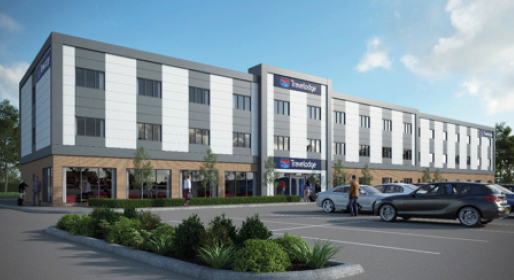 We are delighted to be welcoming Travelodge, which will add to an extensive range of facilities now available for both residents and commercial occupiers at Monks Cross”. Planning permission has been approved for an upper floor residential conversion of 16 new apartments at Nessgate in York’s city centre. The development will be created on behalf of a new property syndicate from Helmsley Group. Helmsley Group Developer Max Reeves says: “This is another major development project for us. We’ll be creating much needed, desirable homes in York city centre. He adds: “The Nessgate project will transform the currently underused upper floors of the property into residential accommodation on behalf of our client syndicate”. A spectacular five-bedroom house on St George’s Place has been completed and sold prior to going on the market for just under £1.4m. Helmsley Group, acting on behalf of Brackenhill Developments LLP project managed the property build. The builder was Yorbuild and the selling agent was Louise Hirst at Carter Jonas. “2017 proved to be a testing time in terms of commercial property investment, with a frustrating lack of stock on the market. This put downward pressure on yields, making prime commercial property an expensive asset class to invest in. We’re now seeing a more positive sentiment and special mention must be made to the industrial sector, which saw the biggest yield shift, mainly due to the rapid expansion of e-commerce, with many of us now choosing to shop online. The technology sector is also likely to go from strength to strength. This will have a positive effect on rental values for both offices and industrial buildings in the regions, due to a lack of available accommodation and limited speculative development. In fact, prime yields in the industrial sector for secured long term income have achieved record values, with some investments selling for 4.25% yield, which we now believe is the top of the market for this sector. We believe this year is likely to be slightly more favourable for property investors. Fallout from Brexit hasn’t been as bad as people feared, unemployment remains low and the value of the pound is starting to rise. This effect will no doubt improve the supply of commercial investments, with many property companies already starting 2018 with sales. Work has started on a boutique development of unusual homes at Clifton Moor, York. The Neon 2 development has been created to help first time buyers in York get on the housing ladder. Max Reeves, Development Director at Helmsley Group comments: “Our experience in the city over the last 36 years has revealed that while York is now well known for its strong housing market, it was also becoming notoriously hard for first time buyers to buy their own home. “The three properties expand on our much-feted NEON development at Clifton Moor, which was 85% sold within the first couple of weeks of launch’. Neon 2 homes will be available in Summer 2018, with the benefit of the Help to Buy scheme to assist first time buyers.